Hello everyone. It's a dark, cold and dreary Sunday morning. Looks like the next few days will be dark and dreary too here in my world. Here's a page from my Nature Journal that I am linking up to Alison's great challenge-Recycle and Collage at Art Journal Journey and also over at the Recycle Challenge at Try It On Tuesday. Not the best photo at the edges, but between the little gemstones I added right at the edges and a bit of a page curl, that's what you get. So I started with a sheet of this tropical botany paper which I tore and collaged onto the page. I mixed my matte medium with some brown ink to give an vintage look, but decided it was too brown. So I covered over most of that with more of the torn and collaged papers but decided I'd leave a little bit showing. I used a TH found relative. I decided he looked like a botanist on a journey to discover some new plants, so I added a hand doodled and cut out botany book, as well as the magnifying glass, also hand doodled and cut out. Then I added the title which is cut from a flyer I received in the mail, and some little green gemstones. I'm being lazy this morning but I need to go do a load of laundry so I can pack this afternoon. I must say I don't enjoy packing and the whole leaving part of a journey. Although I am very excited to go, I just want to get there and begin. Knowing I have a 14 hours direct flight from Boston, a 45 minute bus trip to another airport, a 90 minute flight, and then a 45 minute bus trip until I reach my destination is rather overwhelming. But not so overwhelming I would rather stay home. Hope everyone is having or had or will have a great rest of your weekend. I love this page Erika, great image and background! So happy you are still finding time to join in when you have packing to do for your trip! We have it wet and miserable here today, after yesterday's beautiful sunny and warm day. Guess it's April after all! I love this fabulous page Erika! You are so clever with combining all this together and I specially adore the hand-doodled items you added! I can imagine that the packing and the long flight is not the best of the journey - but this exciting destination makes up for the efforts and preparatory work. And you can read a lot at the long flights! Or you can doodle ?! Thank you very much for another fantastic entry linked to Art Journal Journey and Try It On Tuesday! YOu are simply the best! What a great page for your Nature journal. I agree that the TH doll looks like a botanist. What an interesting concept and a wonderful entry. This was a fun read and a fun journal page. So glad you shared it with us at Art Journal Journey. I know you always have a book in your hand or in your ear, so that should help pass the time when you aren't chatting with your fellow teachers and students. I certainly can appreciate a long trip, but I know you will, at some point, get tired and catch a few zzz's, too. It is bitterly cold here. Two days ago we had tornado warnings, then night came and we had a hard freeze and bitter cold. No moisture, but too cold to be outside for any length of time at all, with wind speeds over 60 mph at times. Just getting to the warm car was a challenge, as I chose Saturday to run many, many errands, including buying tomato plants for my garden. Silly me! 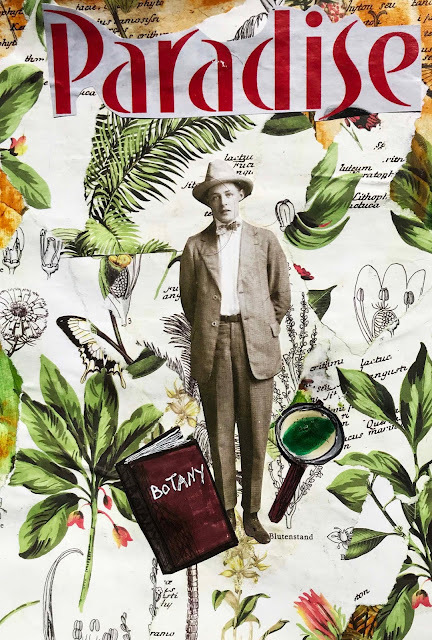 I think your found relative does look like a Botanist. Its a fabulous page and it does look like it could be somewhere on a Paradise island. Thank you for another great page for TioT's and all the support you give us there. It must be getting near you going off on your travels, I hope you got the packing done today. The gentleman does look like a botanist! Perfect addition to the page. I'm enjoying all the green things and I don't have to free while looking at them. I can't wait to hear all about your trip to Japan. 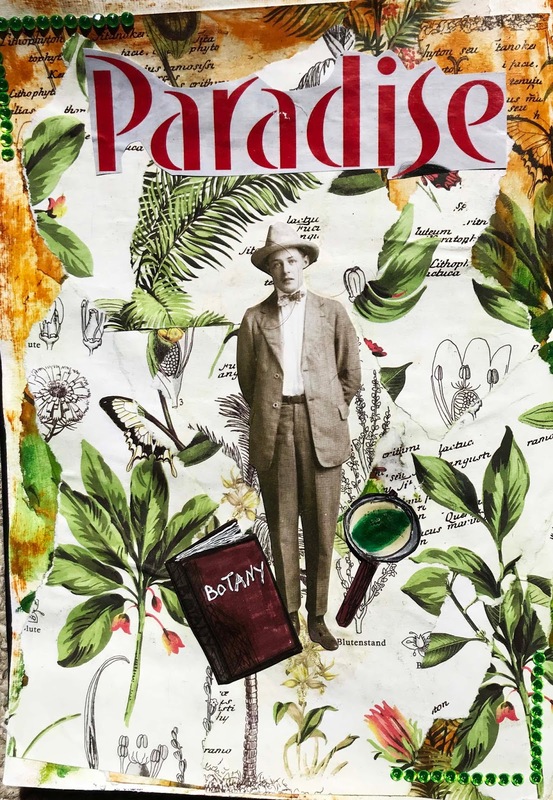 wow,love your paradise page a lot,the man in his botanic world is super,love the photo of him and the green plants. Yes, you will be exhausted. And between the exhaustion, adrenalin and the completely different environment, you may be in for some culture shock. I remember my first days in Japan I was absolutely terrified to be separated from Rick because I couldn't understand a THING or read a thing so I had no idea where I was. It will pass and you will find a country of people who are friendly and welcoming (at least they were to us! Why would they not now?). I don't remember where all you are going but I know you will have a remarkable time -- and best of all, no snow. We're getting that weather crap too. I really do love this page -- the colors, the theme. Nicely done. What a beautiful collaged page! I especially like your hand doodled and cut out botany book, as well as the magnifying glass! 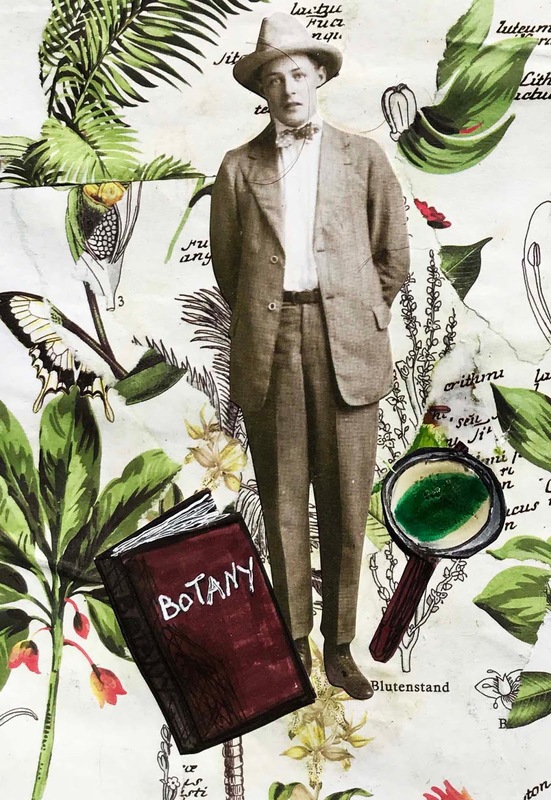 He is really looking like a botanist and makes the eyecatcher in this picture!